The spinner kit is $59 plus shipping. You can find more information here in our Etsy shop. You will need the following items to complete this kit. And just to say thanks for your support we are having a BIG give away! All you need to do is leave a comment to win. You have until midnight on Sunday, June 19th to be included in the give away. We will post the LUCKY winner's name on Monday morning. 3 paper packs from K & Co.
oops ... had to wipe the drool of the keyboard ... look at alllllll that glorious stuff !!! 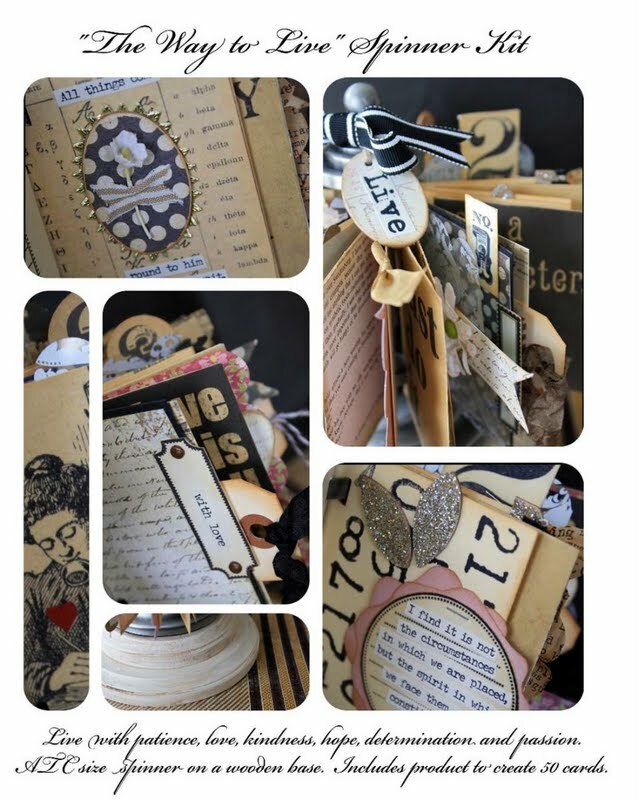 What an awesome giveaway full of vintage, collagey love! Thanks for the opportunity and the daily inspo! I'm new to your site and, as a result, these kits. Wich I'd been here before. This kit looks 'delicious'. 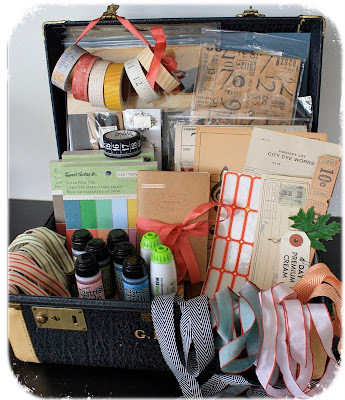 Your new kit looks like lots of fun to make, and the giveaway...WOWZA...awesome goodies!! Thanks for lots and lots of inspiration! Just love this kit. You Gypsy Girls always have the most amazing prize packages. Thanks for the inspiration and your creative ideas! AMAZING! WOW! that's agreat kit and a super fantastic prize.... drooling over the paper tape.... i have a suitcase it would fit in! Great kit, and amazing giveaway. Fingers & toes are crossed! what an amazing giveaway!!! love the paper tape!! would love to have such goodies!! and thanks for the blog -- I enjoy it! I love your kits! They are so inspiring and I learn so much. This time you've really outdone yourself a kit and a giveaway! So many goodies! Wow-this is amazing.Thanks fro the chance at such a fantastic give away of crafty goodness! And what a beautiful giveaway! Wow, there are some wonderful goodies there! Thank you for the chance to win all of this!! My fingers are crossed! I would love to win!! I would like to make everything that I see on your blog! WOW!!! An amazing give away! wholy scrap attack!!! be still my heart...your kits rock!!! your directions are fantastic and everyone should get one...i took your abundance portfolio class and went back and got your drawer class kit. even though you guys weren't there to guide me through the steps your directions ROCKED!!! by the way...great giveaway too!!! Wow! Look at all that great stuff! Someone's gonna be very, very happy when they win that prize! How could I possibly resist such a fabulous giveaway? You have put together such an amazing collection of treasures, I would love win. What a fun giveaway. Thanks for gathering it all together for us. Wow! What a fabulous June project kit! And the giveaway...I'm drooling!!!!!! Love the spinner! Spinner, spinner. Chicken dinner!! I love your suitcase, too. It looks like the one my grandma used to have. Your spinner project is wonderful! Have to check that out and such fabulous things in your giveaway - so much creative potential!! Oooh, what a treat that would be! Play time!!! What a yummy give away - it could lead to creative overload - what fun!! Oh, My Gosh! I am DROOLING!!!! I want, I want, I want!!! Wow! Thank you so much for the chance!! Wow another fantastic kit! What a Way to Live! Ohhh my goodness! What a beautiful kit!! Everything about it...so lovely!! and umm....yowzewr!! What a giveaway!! Would LOVE to get my hands on all those goodies! Perfect for rainy summer day creating! So much goodness!! You girls always create the most fabulous projects, this June kit is no exception! Thank you for the inspiration you give weekly through your blog. This giveaway is like CHRISTMAS....it is jam packed full of gypsy goodness!!!! Thank you for the chance to win. Look at all that inspirational vintage and scrappy goodness! That'll keep the creative juices going! Mmmm what a juicy give away, and sooo generous too. Thanks for all the inspiration. This kit looks fabulous! I've had a spinner that's been sitting empty for years! *hanging head in shame* Thanks for the giveaway! Even without the suitcase, my dears, what a yummy giveaway! And once again, a fab kit!! WOW! What a prize! Love your blog, and thanks so much for all the info you provide. Wow! What a great give away. The possibilities are endless. Great combination of items you included. All I can say is WOW! Love this! Thanks for sharing your creativity and your goodies. What a beautiful display of goodies. Thanks for the inspiration. Love your blog! Gorgeous! Thanks for all the inspirations and creativity. Such a wonderful giveaway! Thanks for entering me. this kit is awesome...but seriously adding your suitcase would really be sweet!!!! Oh could this be my One Lucky Day that I would win. Please let me win, please let me win, please let me win. What a awesome, beautiful, must have kit. You continue to outdo yourselves. Love it! This has to be the coolest giveaway ever!!! OMG! ... awesome giveway. Pick me, pick me! Love your blog. Tons of inspiration! Oh, wow, I'd LOVE to get this goodie assortment - thanks SO much for doing this. What a lovely give away. You are too sweet! What a dream giveaway. Hope my dream comes true and I win. I have a little suitcase to put it all in. Oh wow, what lovely yumminess!!! Thank you for the chance to win all those goodies! Puhleezzz! Suitcase or not.... I could do some damage with that giveaway! Thanks for the chance! Love all your kits! You have always been so helpful with any questions. Thanks for offering a great giveaway. Wow...what a wonderful giveaway...someone is going to be very lucky indeed! I love the kit...what fun to play with! OMG!!!!!!!!! That is Gypsy heaven! Congrats to whoever wins that wonderful prize! Can't wait for my kit to arrive. Lovin the pictures. I think it has my name on it. It would make my year to win this. Fabulous giveaway! Thanks for the chance and count me in! Ohhhh I can't resist!! Please count me in! The kit looks gorgeous and what a fantastic giveaway! Thanks for the chance to win! Love the June kit too..
What an amazing collection of goodies. Thanks for having such a fun giveaway. wow..this will be one lucky day for the winner! This looks FABULOUS!! You two are amazing in putting this together and I would love to be in the draw for this kit! I love you site!! Ok like how much fun would that be to win all that stuff.... your blog is sooooooooo awesome!!! can't wait to get my kit! sooooo pretty! what a sweet prize to share, love the gaffer tape and tissue!! Gorgeous giveaway - you are both so very generous!! Can't wait for my kit, it looks amazing. What a wonderful giveaway! Everything looks divine! ( Would love the suitcase too, Paula! :)Hope I have a "lucky day" Monday! The kit is absolutely wonderful. Holy Scrap, Paula & Deb!!! What an awesome giveaway! Please throw my name in the hat...I'd love to be the One Lucky Girl!! WOW Wow What a wonderful giveaway!!! Hope it will be my lucky Day! Thanks for such a lovely giveaway! What a great stash o' stuff! Thanks for the chance to win. Wowzers...that is quite the kit...and I want it!!! Thanks for the chance! Love, Love, Love all these great items. Fingers crossed. OHHHH... Lotta goodies in this give-away. Hope it's headed my way! I can see LOTS of ideas in the raw materials! Love you Gypsy girls. You are so creative and inspiring. Your Kits are amazing. What an awesome give away. I have been wanting to try the collage paper and the distress stain. Question of the day...Can you toss me in the suitcase and take me along on your adventures? Looking forward to seeing you at a Southern CA scrapbook store. Now what girl would not need a Book Bra I ask you? What an awesome pile of goodness - hmm maybe I'll be the lucky one? I would love to enter. I am almost finished my Christmas Advent Calendar. 5 more tags to go! Oh my gosh what an amazing giveaway! That looks so cool. I would love to add those items to my craft supply. You know how I love anything "7gypsies". I have even thought of selling my first born to get a bigger stash. Sadly, she can run a lot faster than me so I will have to rely on winning additions to my stash. This looks like a great pile of goodies and there are several items there that I don't have. Believe it or not! That looks incredibly special. What an intriguing kit! Thanks for the chance to win! Thanks for all your hard work in putting together the project kits for those of us who want to express ourselves artistically but are somewhat challenged in that department. Sharing your creative ideas with us gets our inspirational juices flowing. I hope it's as rewarding to you as it is to us. Who had me had "vintage". You girls are so generous! What a give away...thanks for the opportunity to win. We ought to be giving you something for providing such a great blog and sharing your wonderful ideas with us. How wonderful is that!!! Please please let all those times I never won so much as a piece of paper pay off and be the lucky one! Thanks ladies for all that you do! Oh my! My heart skipped a beat when I saw your wonderful giveaway!Your blog is always an inspiration. Thanks for sharing. Amazingly generous thank you for giving us an opportunity to create with these wonderful treasures! Oh, it all looks so fun. Thanks for your generosity. Love the giveaway! Thanks for the opportunity to win such a fabulous gift! Ooooooooh, I can't wait to receive my kit!!! Your giveaway looks yummy! Oh pick me pick me I would love to win this fab give away. Oh, my! How generous! Count me in! Can't wait to get my hands on the kit! Finally finished up my projects from the Brentwood classes! Oh I would love to play with that pile of goodies, thank you for the chance to win it! Stunning project...as always! And the display of giveaway goodies is actually making me drool! The Gypsy Girls rock! What a beautiful kit! WOW, great giveaway, Thank you for the chance! Wow, awesome give away. I would love to play with it;-) Keep my fingers crossed!!! Some absolutely fabulous goodies!! Thanks for the chance to win~maybe my luck is still running for the month! How exciting. What a nice surprise to come in the mail. Good luck all!! Wow! I'd LOVE to win this wonderful, fabulous kit! ooops! the sold out! will you be offering more The Way to Live kits? Your kit looks wonderful! What a fantastic giveaway- even without your cutie pie suitcase! Wow,what a treasure trove of fun. Thanks for the opportunity.. I hope to win the contest I have never had anything like this before! I thought the Salted Carmel Square at Starbucks was my all time favorite discovery until I saw this kit. I am a new comer to your blog and have to say how thoroughly enjoying it has been to visit. WOW! Awesome kit and awesome giveaway. Thanknyou for all inspiration. "Holy Green Shoes". I think I should win this! Oh my goodness....I mean, truly GOODNESS! This kit looks simply delicious. I love the spinners and have several ongoing at home, but the one pictured here is gorgeous! You gals come up with the best stuff! Love.it.all! What a fabulous give away, count me in.